Despite having a portfolio comprising of seven sport utility vehicles, Mahindra hasn't really been able to crack the booming compact crossover segment the way you'd expect India's largest SUV maker to. Its only contender in the sub-four-meter SUV space has been the Quanto, which never had the appeal or performance to make a mark. It is no surprise then that Mahindra has made another attempt to shake up the segment and this time around its weapon is the TUV300. Since it looked promising when we reviewed it last year, we decided to pit it against the segment leader, the EcoSport, which in itself has undergone a mild makeover. Here's how they fare. A lot has been said about the TUV300's polarising design. The design sketches seem more Evoque-inspired than battle tank, but the output is far from either of them. The slab sides and the boxy theme appear passé, but the stance is imposing. The appearance isn't the most desirable, but it grows on you. As I mentioned earlier in the first drive, I wouldn't feel awkward driving one of these everyday. There are accessories on offer like the roof-lights, scuff plates, bolstered wheel arches etc to make it look tougher than what the designers intended, but it does lack finesse. 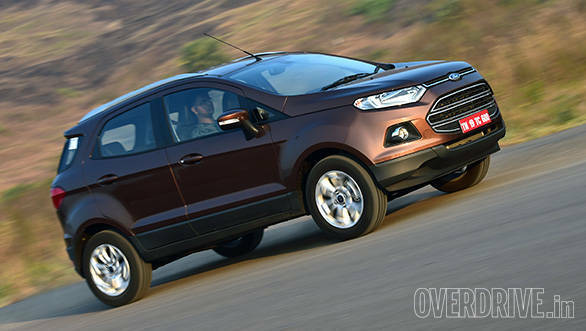 The EcoSport on the other hand comes across as a more well-finished product. Though three years old now, the crossover still manages to look fresh and appealing. The mild makeover gives it tacky white LED light guides integrated into the headlight assembly and the fog lamps now also act as daytime running lamps. 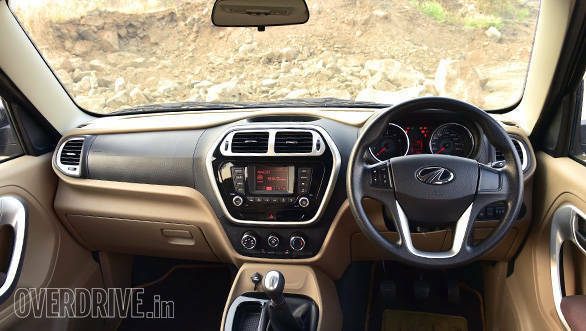 The DRLs on the TUV300 look more purposeful. Unlike the update given to the EcoSport internationally, the Indian counterpart still houses the spare on the fifth door and not below the boot. The spare wheel on the TUV hampers rear vision as it covers a fair bit of the rear windshield. Though both cars measure less than four-metres in length, the TUV dwarfs the EcoSport by being significantly wider and taller, thus adding to the imposing effect. Design is subjective, but both these cars hold their ground rather well. 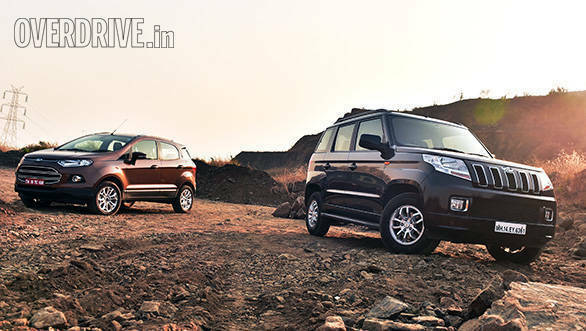 The wider body also makes the TUV the more spacious car out of the two. 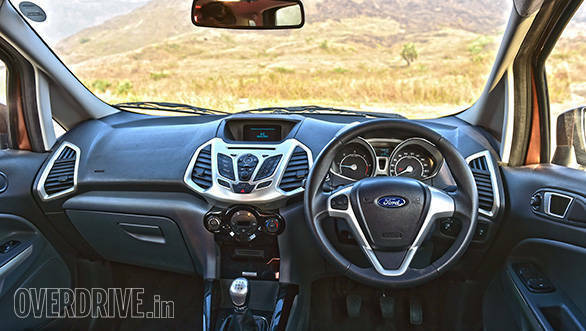 The large windows and the beige and black colour combination for the cabin further adds to the airy feel as compared to the cozier, darker cabin of the EcoSport. While legroom is nearly equal in both, the TUV provides better headroom and shoulder-room. Seating three adults in the back seat is still a squeeze in both the cars, but the Mahindra edges ahead with a flatter seat. For an ideal two in the back, the rear seats of the EcoSport offer more comfort with better bolstering and an adjustable angle for the backrest. Ingress and egress is easier in the Ford too as the floor isn't as high as the TUV's and therefore one doesn't need to climb in. The EcoSport's doors are heavier and need a little extra effort to shut, but that also imparts a higher sense of security to the cabin. The front seats of the Ford felt a tad tight for my generous frame. But the bolstering is better suited for an average-sized Indian and also gets adjustable lumbar support. I prefer the roomier seats of the TUV and also like their armrests better. The front passenger seat of the EcoSport is also a set a little higher than expected and most of my co-drivers preferred the TUV instead. The two cars have a completely different approach towards the design of the centre console. 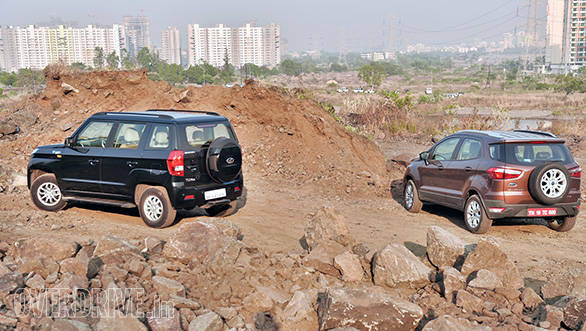 While the TUV goes the minimalist way, the EcoSport takes inspiration from decade old cellphones. The latter seems cluttered at first, but is easy to use once you get the hang of it. The user interface on the hardware and software also seems better thought out in the EcoSport. The placement of charging and audio ports in the TUV feels like an afterthought. That said, the cubby holes and storage spaces are easier to access in the TUV and there are plenty of them. The TUV claims more boot space than the EcoSport on paper, but the unsafe jump seats eat into the expanse, thus giving it less usable space than the Ford. Both are adequate for a weekend's worth of luggage and it's easier to load up the EcoSport, thanks to the lower boot lip. In terms of safety, ABS with EBD is standard on pretty much all the trims for the both cars (save for the base T4 in the TUV). Driver and passenger airbags are standard on all but the base variant of the EcoSport, while the TUV offers them as an option on the base variants as well. However, the EcoSport pips the TUV on overall safety as the top spec trims come with the option of six airbags, Isofix points for mounting child seats and the acclaimed Sync function that automatically calls the emergency hotline in case of a major accident. So if safety for all is paramount, the EcoSport is your car. The TUV300 is based on a modified version of the new ladder frame that underpins the Scorpio. Since Mahindra is developing a sub-four-meter crossover on a monocoque chassis with a more cosmopolitan focus, the TUV300 is targetted towards customers looking for a tougher workhorse that can take on rural roads without breaking a sweat or a bearing. Despite having a lower ground clearance than the EcoSport, the TUV manages to tackle broken roads, potholes and even off-road driving better, thanks to a longer suspension travel. Its ability to glide over undulations and even sharper bumps, is the best in this price bracket. The flip side is a fair bit of nose dive under braking and body roll when tackling bends. The tyres do their job well in reducing the unnerving effect that the body movement can cause, while a full house sobers down the bouncy nature. But these all-terrain type tyres don't inspire confidence on concrete roads. The EcoSport on the other hand seats you lower than the TUV. So though it doesn't give you as commanding a view of the road as the TUV, it manages to feel more car-like to drive. Turn-in is easier too and body roll is comparable to a hatchback. It also stops quicker than the TUV and with lesser nose dive. Ford always gets the suspension balance between ride comfort and handling right and the EcoSport is no different when compared to crossovers in and around this segment. Don't expect Fiesta levels of handling though. The tyres could have been better as the car feels skittish on its feet at higher speeds. There is the safety net of traction control and ESP on the range topping variants, but more grip would be better. As an outright urban commuter or a highway roadtripper, the EcoSport is still the better choice. For the rural expeditions though, the TUV300 would be it. Both the cars tested here are diesels. 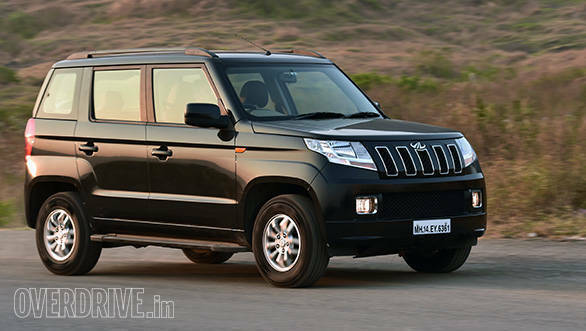 The TUV comes with a three-cylinder turbocharged unit and has a gruff note typical to all Mahindra engines. It settles into a clattery idling speed of a little under a thousand revs and pulls quite cleanly when you get your move on. There is no turbolag evident and 187Nm of torque out of the 230Nm peak output, is available from as low as 1,100rpm making it an easy driver in the urban, extra-urban and rural environment. The mid-range is exceptionally good too, making it marginally more economical than the Ford. The EcoSport's TDCi diesel has been given a new state of tune similar to the one in the Figo Aspire. It now puts out 100PS of power, which is up by 10PS over the outgoing model. The extra horses don't make a big difference to the way the car performs, over its outgoing counterpart. It's significantly more refined and quicker than the mHawk in the Mahindra and has a linear power and torque delivery. The engine feels more eager as well and be city or highway, it doesn't feel out of breath. The EcoSport is also the easier car to drive in the city with a light clutch and steering. That said, the TUV offers the convenience of an AMT gearbox, making it the only diesel-automatic crossover in this bracket. The manual transmissions on both crossovers are 5-speed units. While the TUV300 has a more sure-slotting gearbox, the EcoSport's unit feels a tad too rubbery and the one on our car failed during our test as the threading on one of the shifter linkages wore out. A quick chat with a couple of Ford service centres revealed that this problem, though uncommon, is a known one. Otherwise, the drivetrains of the EcoSport are more refined and are complemented with a better insulated cabin. Since both these crossovers cater to different sections of the segment they dwell in, picking out a clear winner is tough. But if I had to, then the EcoSport would be it. It is more a potent urban runabout, has a more sophisticated design, better safety tech and equipment and that works for me. But if you are willing to overlook these and settle for something a couple of notches lower, then the TUV300 offers more value. Though relatively utilitarian in feel, it presents itself as a more stylish option to workhorses like the Bolero and Quanto. It is surprisingly well put together for its price, which is over a lakh cheaper than a corresponding EcoSport variant. Moreover, it is the only crossover in this space to offer a seven-seat configuration and an AMT option. In the various stints that we had with the two cars, the TUV has always proved to be tougher and surprisingly more reliable, which is what its target audience is looking for. In that sense, and therefore it is up to you, what side you wish to pick.